TUNISIA U.S fieldpost "U.S ARMY POSTAL SERVICE A.P.O. 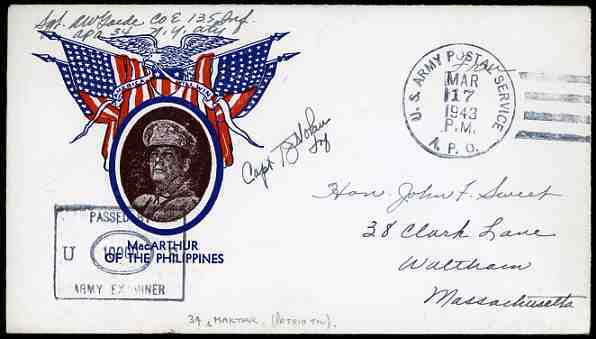 MAR 17 1943" c.d.s on very fine illustrated patriotic cover "MC ARTHUR OF THE PHILIPPINES" send by APO 34 ( 34th Infantry Division stationed in Tunisia from 3 jan 43-apr 43 ) to Waltham/Massachusetts with censor marking "PASSED BY U.S ARMY EXAMINER 10000". On reverse manuscript "Recd from N.Africa 4.1.43".